From Gucci podiums to the ubiquitous communities of social media, the light being cast on vintage fashion has never beamed so bright. So, how does the niche of pre-loved style continue to thrive despite the overbid of new brands? 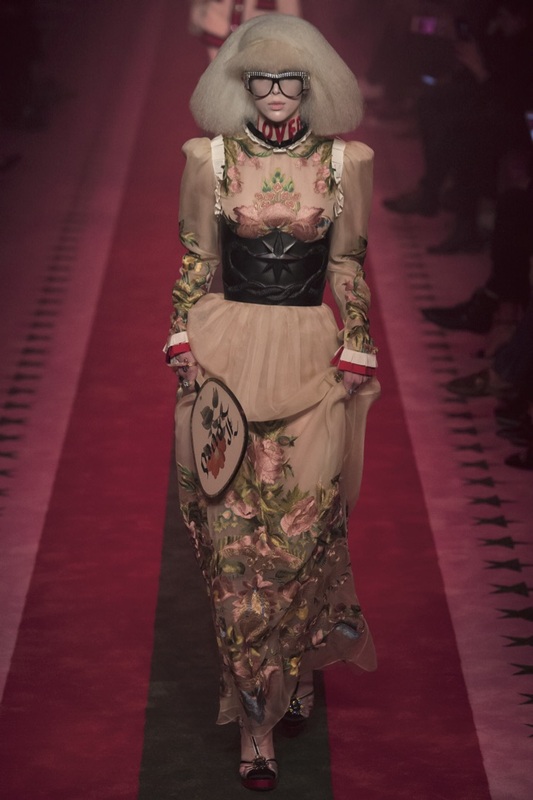 In February 2015, Italian designer Alessandro Michele unveiled his first collection as Artistic Director of Gucci, after several years working on accessory lines. During the autumn-winter fashion week of 2015, he decided to showcase the historic style of the house, with lavish collars, officer jackets, midi skirts and mink coats, announcing the tone of the Michele era which had resolutely vintage inspiration. The following seasons continued to set the tone for the new aesthetic of the house, as Alessandro explored the art of enriching his contemporary cuts and collections with distinctly retro references, defining a style that would become his hallmark. Pieces included XXL sunglasses with smoked lenses, jacquard turban stacks, the accumulation of ruffles, and long pleated skirts. The public was enamoured, and still is today – with Gucci once again becoming one of the most desirable brands of the decade. To wear contemporary pieces inspired by another time may seem paradoxical, but trends are showing that many customers now prefer second hand items to newly purchased clothes, not just by way of economy, but also ecology. As we as a society become more informed of the harsh realities of the fast fashion industry, the urgent need to find solutions to make it more sustainable has been labelled by business journals as one of the top ten greatest industry issues. The notion of buying second-hand clothes is one that may have once only been relevant to those of lower economic status, or creative types seeking to make a statement or elevate their own self expression, but is now vastly becoming an ecological gesture in the modern world. Fashion is cyclical, and a contemporary piece will almost always have it’s vintage equivalent, perhaps even better realised and in a stronger material, with higher quality, ethical modes of production. Large, modern day retail giants thrive on the opposite – favouring quantity over quality, which often means considerably reducing the quality of materials, the thoughtfulness of the craft, and the support of the workers behind the garments. What it all comes down to is educating consumers about adopting more thoughtful buying behaviours. A new generation of entrepreneurs have taken this industry challenge in their stride, taking advantage of platforms gifted by the technological age to recirculate old items and see styles resurface and live on, without the production of anything new. Internet sites in Europe such as Vestiaire Collective and Vide Dressing offer second hand luxury, vintage or contemporary clothing, at attractive prices, similar to many walk-in stores now emerging or gaining regard around New Zealand. The timeless work of Marilyn Sainty is heralded in New Zealand fashion history. She’s the gentle and brilliant minded icon behind pieces that defined a shift in the fashion of our country. Through times when limited clothing options were available in our stores, through to the rise in competition brought on by international market expansion, her elegant, punctilious, and buoyant approach to creation has been the warrant for pieces that transcend trends and still hang pride of place in many women’s wardrobes. One year on from retiring from the industry in 2005, she was awarded membership in the New Zealand Order of Merit for her services to the fashion industry, and today still has ownership of Auckland-based Scotties Boutique and it’s vintage counterpart Scotties Recycle. The store stocks curated treasures from Marilyn’s past collections, and brands such as Acne Studios, Ann Demeulemeester, Comme Des Garçons, Dries Van Noten, Issey Miyake, Marni, and Sofie D’Hoor. Scotties Recycle location: 2 Blake St, Ponsonby, Auckland.